The Résumé Business Card - What Is It? What is a Resume Business Card? The Resume Business Card is the networking necessity of your job-seeking arsenal. 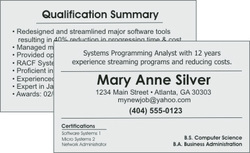 Specifically designed to be brief, concise, and impactful through key word usage, the Resume Business Card does not contain the wordy employment history and educational nuances typically included in the actual resume; rather, it simply provides the reader with the "sizzle off the steak" about you - all contained on a professionally printed 2" x 3 1/2" (business card size) card stock. professionally showcases your name, area of expertise, any applicable certifications and/or degrees, and your contact information. Then, a brief summary of your qualifications is provided on the backside.